Market Reality is an understanding of past market cycles, current market forces, and future market opportunities based on a complex set of economic, political, cultural, and other situations that affect farm incomes at any given point in time. Market Stress is an extended time where low product prices or high input costs cause negative margins and/or negative cash flow. Market Grief is a reaction to the loss of something (profit or way of life) that is loved and cherished because finances or cash flow do not work out for extended periods of time. 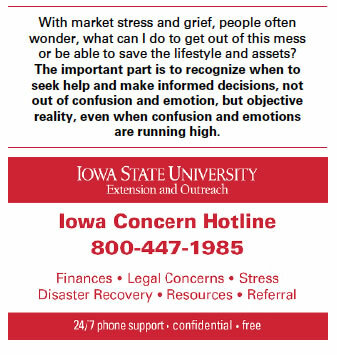 It may be an exasperation of a "Holy Cow" to a situation beyond control. Alternatives seem limited or are difficult to adjust to or realize in the new market norm. At times, farmers get ravaged by the economy. Dairy prices plummet from time to time, which can last for years. Crop and other livestock prices often do not fare any better, minimizing alternatives. In 2014, for example, dairy farmers were getting over $20 per hundredweight for their milk. In late 2018, that number sat below $14 cwt. The 2018 average was the lowest average of that four year timeframe - a timeframe already previously stressful! To put this in perspective, the 2018 breakeven price for many Iowa milk producers was well over $17.00 cwt. With the 2018 cow and heifer prices going below $40 per cwt., selling heifers meant losing more than half the cost of growing them. In a depressed cow market, selling cows may mean forfeiting lots of the value of milk cows on the balance sheet. So, how does one spell stress and grief? Dairy producers have heard time and again they need to use records to fine-tune their management to find every penny of margin. Getting back to the basics - knowing their cost of production; feeding and breeding efficiency; producing the most pounds of solids per hundredweight of milk; improving the milking system to increase labor efficiency; breeding superior females for needed herd replacements and breeding the lower quality females to beef bulls that generate added revenue. Many have done all that and more, and the numbers still may not work out. Dairying might get even tougher in reality as markets change. Exports might not clear additional milk and processing capacity sees constraints. Markets are not always humane - providing a price to balance supply and demand, even if low. Benefits of a free market do not come without cost. A sad reality is the probability of an extended dairy recession even worse than the past few years. Somebody or something needs to clear the market, meaning producers continue to leave. Making the Tough Choices and Seeking Marketing Options. While many producers do not use a risk management tool, they are available and can be useful. For example, the 2018 Farm Bill gives dairy producers new market protection options, which, in reality, may actually protect the over-supply of milk. It renames the Margin Protection Program for Dairy (MMP-Dairy) to Dairy Margin Coverage Program (DMC) and permits participation in both DMC and Livestock Gross Margin for Dairy (LGM) on the same production. DMC and the Dairy Revenue Protection program may also be used together. The DMC program is vastly improved from the old MPP and when combined with LGM coverage, should be considered by every dairyman, no matter how many cows they milk. Every farm needs an operating plan, and as important, an exit strategy - setting a point where one is no longer willing to accept equity loss and will exit the industry or reallocate resources to another enterprise. The easiest route is to do nothing and hope things resolve themselves. Unfortunately, that hardly ever works. Remember, there is life after the cows leave the barn or even after people leave the farm. It is a tough reality, filled with stress and maybe even grief, but is often a necessary outcome in times of trouble. Farmers need to be resourceful when considering how else resources can be used. Farm alternatives or off-farm jobs might not be a great choice, but a possibility needing consideration. Often, a conversation with someone who has gone through an "exit" can be helpful. Bringing others, including extension specialists, into the discussion might help to bring out ideas that otherwise might not be considered. Hopefully, all the market reality, stress and grief can be worked through: making tough choices, reaching out to others, exploring options, and giving life a new reality. Hopefully, a new acceptance is attained that gives hope to meaningful life - a life that maybe just different than before.